Be the first to share your favorite memory, photo or story of Dixie . This memorial page is dedicated for family, friends and future generations to celebrate the life of their loved one. 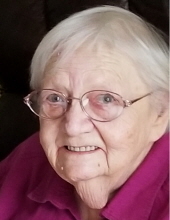 Dixie Wallace, age 88 of Boone and the Accura Healthcare of Ogden, died Sunday, September 30, 2018 at the home. A Funeral Service will be held on Friday, October 5, 2018 at 1:00 pm at the Schroeder-Reimers Memorial Chapel at Sixth and Marshall. After the service, per her wishes, she will be cremated. Dixie Elgean (Arrasmith) Wallace was born August 18, 1930, in Boone, Iowa the daughter of Charles and Esther (Hults) Arrasmith. She graduated from Boone High School in 1948. Dixie was united in marriage to Donald Raymond Wallace in 1953 in Omaha, Nebraska. Dixie was a truck driver for Barr Nunn Trucking in Granger, Iowa. While she was trucking with her husband, Donald, they both received special trucking certifications after competing in a trucking competition. She retired from Barr Nunn in 1997. In her free time, she enjoyed watching TV, reading books, crocheting, spending time outside, especially, fishing with her husband. Dixie is preceded in death by her husband, Donald; her parents; her sisters, Charlotte Erickson and Delores Stevens and a son in infancy. She is survived by her two children, Linda Williams of Ogden and Donnie (Shirley) Ackers of Grand Forks, North Dakota; sister, Katherine Moore of Allen, Oklahoma; nine grandchildren; twenty four great-grandchildren; and two great-great- grandchildren. Friends may call on Friday, October 5, 2018 at the Schroeder-Reimers Memorial Chapel from 11:00 am until the time of service. In memory of Dixie, memorials may be directed to the family. To send flowers or a remembrance gift to the family of Dixie Wallace, please visit our Tribute Store. At this time the family will be present. "Email Address" would like to share the life celebration of Dixie Wallace. Click on the "link" to go to share a favorite memory or leave a condolence message for the family.